There exists seven species of sea turtles world-wide. Four are commonly found on the Atlantic coast of the United States: Green (Chelonia mydas), Kemp's ridley (Lepidochelys kempii), Leatherback (Dermochelys coriacea), and Loggerhead (Caretta caretta). Accurate population numbers are difficult to determine because turtles seldom come onto land where they can be counted. What is known is that the population of each of the seven species is in steep decline -- each is listed as 'threatened' or 'endangered' under the Endangered Species Act. While young sea turtles have many natural predators, it's primarily interaction with humans that has caused the collapse of sea turtle populations. Human-caused changes to beachfront areas often interfere with nesting behavior, and will sometimes prevent females from nesting at all. Boating, fishing, and dredging can harm or even kill sea turtles off-shore. Decisions that we make every day about living and playing on coastal lands are extremely important for the survival of sea turtles. The activities of various researchers are featured in this project. Some are investigating nesting behavior and outcomes; others are tracking migration patterns; still others are rehabilitating injured or stranded turtles. Together, they are working to better understand how best to protect and conserve these remarkable animals. 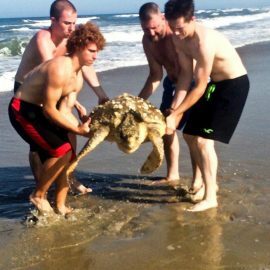 Sea turtle research and data collection is a year-round activity on the Outer Banks of North Carolina. There are daily counts of turtle strandings and incidental takes. 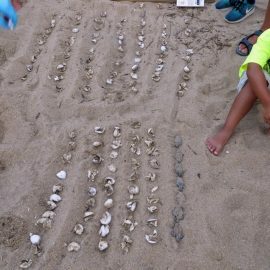 As well, sea turtle nests are closely monitored throughout the entire season, and DNA samples are taken at each nest in an effort to better understand sea turtle reproductive behavior. Sea turtle conservationist Jackie Orsulak reports on what is turning out to be a very interesting sea turtle nesting season on North Carolina's Outer Banks.